Heck Nominated for Oregon Reader’s Choice Award! The Oregon Reader’s Choice Award is an exciting way for discriminating Oregon 4th—12th graders to choose their favorite book in a real-life democratic process. Oregon students, teachers, and librarians are all able to nominate books based upon a number of criteria, including literary quality, creativity, reading enjoyment, reading level, and regional interest. This spring, students will decide the winner! Cross your fingers, toes, hooves, and barbed tails! And, until then, check out the Heck Discussion Guide, courtesy of the Multnomah County Library. 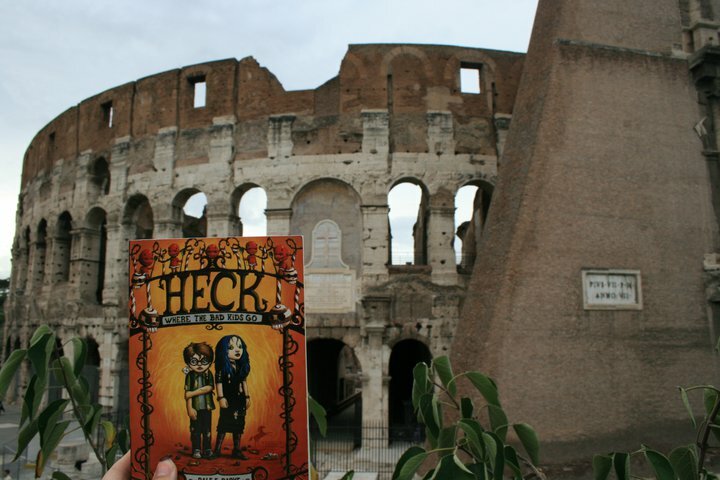 Grazie a Eryn Lerum che, apparentemente studiare all’estero a Roma, ha trovato il tempo per scattare una foto di Heck: Se la Bad Kids Go, al di fuori del famoso Colosseo! Grazie Eryn! Choose a field: something that will conceal your flagrantly illegal act yet is still visible enough come the dawn to draw the media attention you so crave. Drop off the planks and roller near the site by some identifiable marker that you can find in the darkness. Park your vehicle away from your site as to not arouse suspicion. Walk back to the site to the point at which you have previously decided will be the center of your design. Move to this point using tractor lines. From the center of your circle about six feet from the nearest tractor line, spin around in a tight circle on one foot while dragging the crop down with the other. Place the marking pole at the center and attach the tape before walking out to your predetermined radius. Walk the perimeter, dragging one foot as you go to leave a trail, until you return to your starting point. Next, get out the planks and roller and get to work! The planks are ideal for angular, detailed work while the roller is a powerful ally in covering a great deal of ground while lending subtle curves. A circle flattened from the inside out will create something called a “radial lay,” while the reverse will approximate a concentric flow. For added credibility, try to select a shape that has some mathematical or mythical importance (i.e. nothing obscene or related to your college football mascot). Before you finish your formation, always check for accidentally cast human detritus such as beer cans and cigarette butts: anything that researchers will not likely associate with higher life forms. By carrying with you either a magnetometer or calibrated dowsing rod, you can leave behind a confounding electromagnetic residue. Extra points for mysterious, anomalous goo or chemical substances left in the middle of your creation: the nougaty center of your perplexing, paranormal riddle. 2) Make contact with a technologically advanced extraterrestrial race. • After contact is made, decide on a common language (I suggest Esperanto or a binary-based language…in a pinch that catchy melody from Close Encounters of the Third Kind can get a dialog going). • Next, submit a shape that you think would make a compelling field of dreams (or nightmares). Most extraterrestrial races are more than willing to work with you on shape development for a minimal surcharge. Sometimes you can get “two-for-one” deals where they throw in shape design as an incentive. Hold your ground. Many aliens will attempt to charge you an arm, several legs and what appears to be a pronged tail. • During the shape review process, be sure to ensure that your shape affects on an emotional level; uses complex codes to communicate a new language; or is strong enough to survive the inter-dimensional transfer process without compromising the design. • Now the fun part: selecting a field. 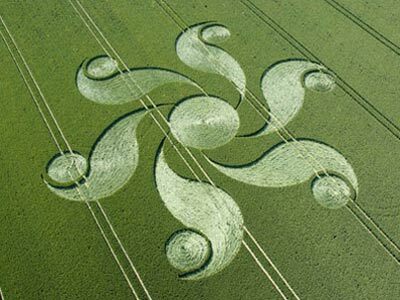 Cornfields make a bold statement, yet never underestimate the subtle sculpting properties of wheat. Most alien races have detailed maps of their favorite fields and regions, but don’t be afraid to bring a relatively new field to their attention. You are the artist and know best what canvas would prove most complimentary to your unique work of artistic expression. Also, take into account the collective psyche of the region you select and what would freak them out the most. • Before your shape is transmitted, have your lawyer review your design and the trademark laws of the selected country, to ensure that no branding transgression has occurred (it is best to avoid anything remotely resembling a swoosh). • Lastly, sit back and enjoy the pandemonium your weaving, inscrutable pattern of broken stems creates. This approach, while intriguing, is expensive and may well incur the possibility of hostile extraterrestrials abducting you and your family while you sleep (most extraterrestrials receive their human medical training by playing Operation… and, as many of you know all too well, there is nothing colder than an alien probe). For more information on writing, visit http://www.wherethebadkidsgo.com. •	My writing process: Put off, freak out, write on. •	The inspiration for my current book: my devotion to the Heck series and expanding/deepening the emotional world of the characters; contractual obligation. •	A challenge I faced when writing my current book and how I overcame it: Having to write a book in a few months, staying with it until it was finished, editing it again and again until it was pretty good. •	How much truth is there in my work and how do I handle that? : Lots. I am not nearly creative enough to fashion worlds and characters from scratch. I always have to draw from some personal experience. I just make sure it blends well with the story. I find that the nuggets of “truth” act like little hooks that pull the reader closer. •	What are you reading right now? : I am reading Ghost Map: The Story of London’s Most Terrifying Epidemic – and How it Changed Science, Cities and the Modern World by Steven Johnson. I love reading books about diseases. I find them infectious. •	What is my favorite food? : I don’t care for food. It always ends up making me have to go to the bathroom. •	What writers have influenced me? : Most every writer influences me in one way or another—a clever turn of phrase, a particularly concise sentence. Even bad writers influence me, hopefully for the better. I love reading the work of Heck’s fans. As a kids’ writer, it’s important to read kids’ writing. •	What am I working on now? : Snivel: The Fifth Circle of Heck. Posted in Fun Questions from the Author!, Interviews with the Author! Short video about the making of the WhereTheBadKidsGo site. Each of the wizards have their own army. The Bad Wizard tries to kill the Good Wizard’s friend, but the Good Wizard intervenes and receives a broken leg for his trouble. Little do they know, but both wizards are secretly brothers. The Good Wizard stumbles on this (it’s pretty easy to stumble with a broken leg) as he uncovers the Bad Wizard’s plot to kidnap a member of the Wizarding Royalty. The Good Wizard begins his quest to rescue the abducted royalty. The Good Wizard breaks into the Bad Wizard’s secret hideout, rescues the queen, and—upon being discovered—wages a catastrophic battle with the Bad Wizard. Unfortunately, the world blows up, leaving but one large piece of rock floating in space. A passing rocket ship of surviving astronauts, in orbit during the disaster, dub the rock New Earth as they go about their mission. One person, however, is still alive on New Earth. Lindsay Lohan! She, after examining the rubble, learns of the wizard battle that destroyed her planet and vows to become a wizard herself to begin the New Earth, populating it with her conjured slaves! Bugs Bunny dressed as Superman and the Incredible Hulk are best friends and like to hang out at the Magic Shop in the Forest. Unfortunately, Bugs Bunny dressed as Superman is playing with a large magician’s hat to see if he can fit inside, you know, like pulling a rabbit out of a hat and it falls on the Incredible Hulk’s nasty green feet. Since he never wears shoes and is prone to explosive anger, he is enraged. Bugs Bunny dressed as Superman tries to run away, but the Incredible Hulk grabs him. Bugs Bunny yells and drops the hat again. Hulk screams “Hulk smash Bunny!” and Bugs Bunny dressed as Superman yells “Help me mom!” Bugs Bunny’s mom, who is also dressed as Superman for reasons unclear, arrives quickly on the scene and, wielding a wicked potato, hurls the spud squarely at the Incredible Hulk. “Hulk mash potato!” yells the green mass of rage. 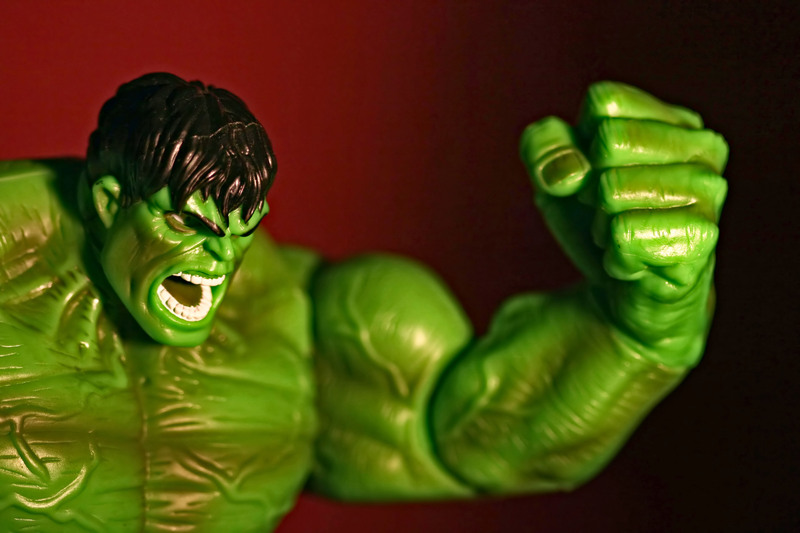 The Incredible Hulk is so furious that he begins to punch himself in the face. The Incredible Hulk quickly subdues himself and falls down, with Bugs Bunny dressed as Superman stomping on his face. He and his mother make an army of evil mutant carrots using the various potions in the Magic Shop in the Forest yet, unfortunately, they bring about doomsday…or do they??? Governor Arnold Schwarzenegger and Sadie Blanchette are fighting over a giant pickle on Facebook, using the social networking site’s least popular application, Fight Over a Giant Pickle. The contested pickle, without warning or provocation, runs away. Governor Arnold Schwarzenegger is suddenly incredibly depressed while Sadie, meanwhile, spins around in her chair, rubbing her hands together, laughing “Moo-ha-ha!” The Giant Pickle, freed from Facebook, is almost instantly assassinated–apparently—by Shadow the Hedgehog who is working in cahoots with Sadie Blanchette as her paid ninja killer. Governor Arnold Schwarzenegger, upon learning of Sadie’s treachery, releases his secret army of Barbie dolls, equipped with deadly lasers and saws. Meanwhile, the Eternal Void of Nothingness spreads and explodes, but—being nothing—its destruction results in Everything. The universe shifts subtly yet irrevocably as Governor Arnold Schwarzenegger weeps softly to himself at his desk in Sacramento, California. His arch nemesis Sadie Blanchette and his beloved Giant Pickle—not assassinated after all, it seems—have gone missing. Governor Arnold Schwarzenegger performs a few dozen bench presses and then rides into the sunset on his pretty pink unicorn. Recently I was interviewed by the wonderful Rebecca Cohen from the Newport Public Library in honor of my visit there this week. I had a great time with Ms. Cohen, Lady Literacy of the beautiful town nestled on the Oregon Coast. She escorted me to a couple of fabulous schools and then later that night I gave a talk for adult writers on how to write for children (as if I know anything about that). In any case, Part 120101004a and Part 220101004b of my interview are available for your listening pleasure.